If your blood test shows that you have high amounts of cholesterol in your blood you will probably want to know how to lower cholesterol levels. Cholesterol is produced naturally in the body. While the majority of cholesterol is manufactured by your liver, a small proportion is absorbed from your diet. Your body needs a certain amount of cholesterol for forming cell membranes, producing bile and to protect your skin. The normal cholesterol level in your blood should be less than 200mg/dl. An increased level of cholesterol can increase your risk of atherosclerosis, heart disease and a stroke. Atherosclerosis can remain undetected for decades and may only be diagnosed when the disease has reached a very advanced stage. It is one of the most significant and frequently occurring diseases in the UK leading to circulatory problems. Heart attacks and atherosclerosis combined represent almost 40% of all deaths in the industrialised world. Atherosclerosis of the blood vessels surrounding the heart leads to a decrease in blood flow to the muscle of the heart resulting in vessel blockage and potentially a heart attack or heart failure. For this reasons, early diagnosis is essential in order for changes in diet, lifestyle and medication to start as soon as possible. Early detection basically means the determination of risk factors. These days it is generally accepted that high cholesterol levels is one of the most significant risk factors for coronary heart disease. This cholesterol test will allow you to find out quickly and easily whether or not your cholesterol levels are in the normal range. If your test result shows that your cholesterol level is high, then with advice from your doctor, you will be able to take appropriate action to drastically reduce your risk of heart disease. Cholesterol levels may be influenced by medication, diet, stress, diabetes, serious illnesses and pregnancy. In order to get meaningful results you should delay testing your cholesterol levels after pregnancy or a serious illness for around three months and after three weeks following a minor illness. 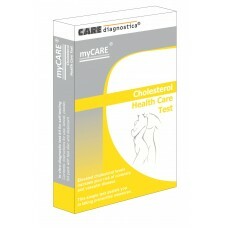 Ideally your cholesterol levels should be measured on an empty stomach. This means that you should have not had anything to eat for around 12 hours before using the test. Your test results should also be read in daylight or in a well lit room in order to accurately assess the colours of your result. 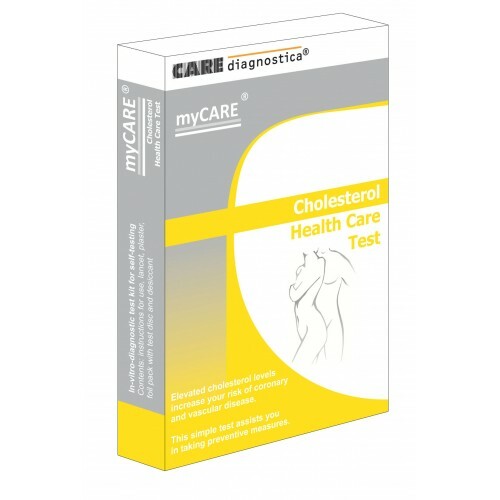 How does our cholesterol test work? Prick your finger quickly and easily with the sterile finger pricker supplied to obtain a drop of blood. Add the drop of blood to the test card and wait 3 minutes before reading your result on a colour chart. It is as simple as that. How does our test compare with a test from your doctor? The test has been shown to give results equivalent to doctor’s test and is regulated according to the IVD Directive 98/79EC which demonstrates that the test has been independently assessed by doctors and medical scientists and found to be easy to use most people and gives reliable results. If the cholesterol level in the blood remains persistently high, deposits on the walls of the blood vessels cause atherosclerosis. This disease develops unnoticed over decades. However, it can be detected and treated in time if diagnosed at an early check-up. Foods with high fat and cholesterol content, a hypoactive thyroid, badly managed diabetes, chronic liver disease or long-term use of various medication such as the contraceptive pill or diuretics can lead to increased cholesterol levels. Monitoring your cholesterol levels can also help show the beneficial effects of a low fat diet.